An anti aging supplement working with your body's cells is the key to longevity. Resveratrol combined with a blend of polyphenols influence the biological aging process in many positive ways. Science and research has discovered how to fight the 4 ways our cells are damaged and age. Aging starts with our cells. Stress, poor diet, and environmental toxins bombard our cells everyday and create havoc. The more they are exposed to these threats, the more vulnerable they become to damage and the conditions that can trigger aging. Everyday your body's cells need to make repairs and and create new copies of themselves. 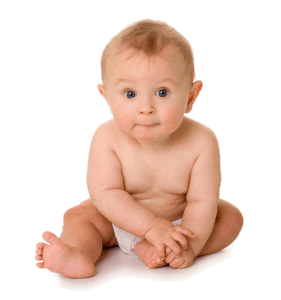 Biological changes in our body can cause us to age starting as early as birth. These changes add up over time and you lose certain body functions. A recent study on Americans diets estimated that on average we eat 3 hamburgers and four orders of french fries each week. In fact, the top 3 'vegetables' we eat are Ketchup, French Fries and Iceberg Lettuce. Studies also show that foods high in fat create extra biological stress on your body which can contribute to cellular aging. Aging is a natural process that can't be stopped. However, studies have shown that improving your diet and nutrition can slow the aging process. Supplements are one way to enhance your ability to get all the essential vitamins and minerals your body needs. Because even if you do avoid processed foods and eat a more natural health diet, the nutritional value of farm fresh foods had gone down by around 40% over the last 50 years. An anti aging supplement can slow this breakdown at the simplest level - the cell. Current research proves that a natural anti aging supplement will influence the biological aging process in positive ways. Everyday we face 4 different threats to our health and our cells ability to maintain their youthful performance. DNA is bombarded millions of times every day by harmful forces that cause problems or 'typos' during a cells replication process. Genetic regulators within the cell wear down over time. They lose the ability to balance damage and repair of the cell. Mitocondria - the Power Plants of the cell begin to slow down and can't produce as much energy so cell function declines. Advanced Glycation End (AGE) Products build up in the cell and cause cellular damage that can damage the cell and kill it prematurely. Over time, these 4 threats continue to bombard our cells and cause them to age. In turn this causes our bodies to age and wear out. Its natural. Introducing the world's best anti aging supplement. After years of research, scientists have developed a way to create a unique polyphenol blend that has shown in laboratory studies that it can fight cellular aging. It fights all 4 threats to our cells - In laboratory tests it has positively impacted the four key threats to our cells and the aging process. We have all heard or read about the benefits of drinking red wine because of the resveratrol. Resveratrol is a great antioxidant. It removes dangerous and harmful free radicals. It is also thought that it may be capable of actually killing cancer cells that have developed in the body. 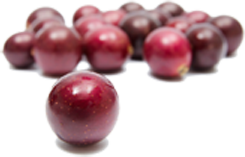 Resveratrol protects the central nervous system and regulates hormones. It can reduce the risk of Alzheimer's disease. Combine resveratrol with Vitamin C and Vitamin E and it works even better. Recent studies indicate that resveratrol plays a critical role in improving longevity and increasing the length of life spans. Finally, it is believed that resveratrol may be crucial in preventing certain kinds of cancer, especially breast cancer, and reducing the risk of cancers spreading into bones. With all these benefits resveratrol alone seems like it would be enough. But why settle when you can have more? Combine the most potent resveratrol available with super polyphenols and you have a revolutionary breakthrough dietary supplement. By harnessing the special cellular anti-aging power of a one of a kind super grape and combining it with ultrapure, natural resveratrol scientists have achieved a revolutionary breakthrough in the fight against cellular aging. 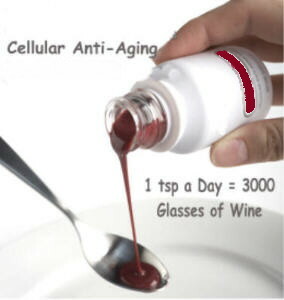 Each serving contains the same amount of resveratrol as 100 glasses of red wine. If you are committed to achieving and maintaining a healthy, well balanced lifestyle this revolutionary supplement is for you.